Only endorsed by the best!! Jane Whittaker is our outstanding contact in Andorra. A British expat, she’s extremely well connected, discreet, and savvy. 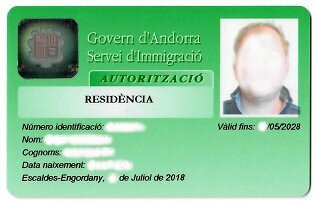 The Andorra residency card is what this process is all about..
A proliferation of new websites offering residency applications. Let me distinguish between those and my services. 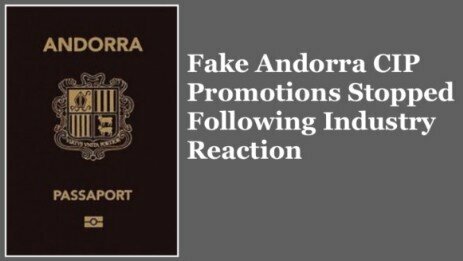 More often than not in other websites you will find conflicting information and even scams involving Andorra residency. Moreover whenever you read on other sites the categories of Residency labelled as "Category A, Category B "etc etc the information has invariably been taken directly from this, my website: How do I know ? Because Immigration do not label the Categories as I have laid out here as A, B and C etc. , only this site has labelled them as that for ease of reading and people compiling similar websites have copied blindly! So be careful as wrong advice on other websites is abundant. Immigration decisions are dynamic and fluid to say the least, what is written in law as a lawyer will advise you is to ignore the fundamental interpretation of the legal elements upon which Immigration alone decide. With three scheduled appointments per week I am the best placed to advise and I do so as openly as possible in this website. Laws and regulations such as the examples above are changing fast here and most websites do not keep up with the changes. If you come across differences in information I guarantee that this site is correct. Only yesterday I did some online research and quite frankly the information out there is appallingly out of date and incorrect, and all this from sites that purport to be lawyers, specialists, expat guides. Please accept that this website is updated as often as new decisions edicts or policies come out. In Andorra nobody in office informs anybody, and I only get those potentially game changing snippets through regular almost daily visits to Immigration and Government. There is a huge distinction between those offering property and residency and the mechanics of actual relocation which I take pride in offering in Andorra. Several years ago I decided to market Andorra through this website set up specifically with relocation as the primary objective. In this way property, which estate agents of course have as their primary objective, becomes a secondary (but important) consideration. Property is just one factor within the relocation process. 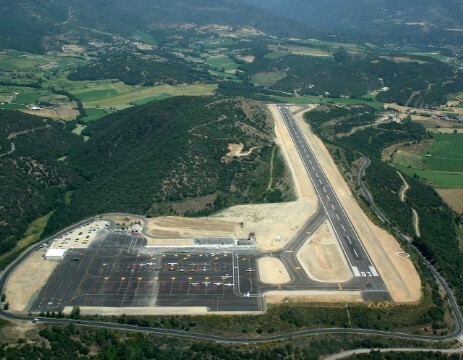 Andorra is now becoming better known as a destination, more so since the austerity measures and the ever increasing reach of the tax man. Indeed many estate agents have now decided to push residency higher up their agenda and have recently set up similar websites that offer residency applications. Before this website only estate agents who marketed property for sale and for rent made any mention of residency other than as a bye-product of selling property. My services go way beyond mere residency application and property, and concentrate on your physical relocation and that also involves everything from removals, schooling, GPs, attending the scene of an accident where the client is being shouted at in Spanish, attending hospitals with clients and so on, I look after the well-being of yourself and your family in an unfamiliar country. It has been over 10 years since I set up this website with a view to sharing with the rest of the world what Andorra has to offer. The response has been amazing with more than 53,000 emails,more than half a million website visits, and above all I have been able to welcome through the application process so many wonderful individuals and families. It is always so rewarding to me to see mothers collecting their multi-linguistic kids from school when it all simply started as an email enquiry. I look forward to the coming years, even with the tax system in place and complicated categories of residency, I am here to make things painless for you should you wish to come and live in this wonderful country in the mountains. I have extensive contacts both in Government and with local estate agents, experience with the documentation and an in-depth knowledge of the Government requirements. 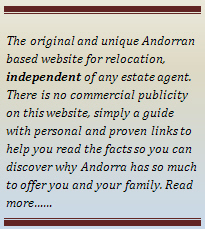 I am proud of my ability to be able to help you and I can make your relocation to Andorra painless. I can assure you now that enjoying the benefits of living in Andorra is easier than you may think and I am here personally to help you through the process! Everything you need to know about residency in Andorra can be found here on this website. No need to submit your e-mail address for those nuisance follow-up emails, no need to fill in proformas, and if you do have specific questions, then call me! I am continuing to add to my website which has received some kind comments for which I am most grateful and which I include on my feedback page. In particular my page on frequently asked questions contains many answers to questions that you may have. I will continue to add pages on subjects that are topical and of assistance in your decision making. Please continue to contact me on any questions you may have about Andorra, living here, property, passive residency, holiday homes, importing of goods and cars, and any advice you may need about finances, laws, banks etc. I have extensive contacts to help and advise, but as already stated you will have my personal attention from the date of your email to me or phone call. Relocation and living in Andorra involve so much more than a residency application, and "pre" and "post" application services for a family are so vital for settling in to a new country. I would like to explore further, it seems Andorra has considerable advantages for myself and my family. Click here and email me right now, all circumstances are individual and I do want to ask some specific questions, or just get the ball rolling! click here to email me now. If you are intending to make a visit whether preliminary for familiarisation of more importantly for immigration application, i need to make considerable appointments and these can be difficult at the last minute as can be my schedule. I would not wish for you to be disappointed for any visit. To this end it is important for me to have a least 2-3 weeks’ notice where if possible you could check with me before you are booking a flight or travel plans. Your contact is very important to me and I strive to offer a much personalised service. Thank you for your consideration. Located in Anyos, Dave delights in home cooking please click here. Allain and Belinda who run Sports Sensacio have kindly agreed again this year to offer clients discounted ski hire and a special honesty box. 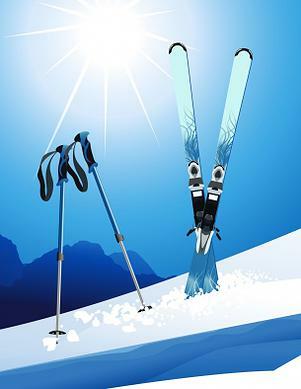 In this you or your family or visitors can hire the ski equipment for the whole period of a visit and when you hand back the equipment at the end of the period just tell them how many days you actually used them and be charged only for those days. The great advantages of this is that you do not have to hire, hand back re-hire in your days off or if the weather is bad. Just mention the website to Allain or Belinda and they will sort everything out for you. 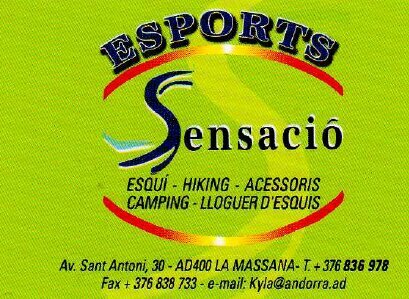 The shop in La Massana is near Andbank opposite the BP garage....Happy Skiing ( Please see logo Esports Sensacio).